I believe I am ready to declare victory in my battle to get excellent guiding... At least at focal lengths of 1000mm on an APS sized DSLR chip (1600mm effective focal length as compared with 35mm film). I am now able to use the full resolution of my images without downsizing them to hide guiding errors in my photographs. Here are a few summarized points for advanced astrophotographers. Polar alignment is important, but maybe not as important as you think. How aligned you need to be is discussed here. Align your guide scope with the center of your image frame if you can. -Do the test I mention below and convince yourself that the mount guides very well to begin with. -Guide such that you make corrections every 2 to 4 seconds. Otherwise you will probably be chasing seeing and degrading your results. If you can, guide based on multiple images averaged. -If you are definitely drifting in a certain direction in DEC, turn off guiding in the other DEC direction. Turn down the aggressiveness in DEC anyway, as your DEC drift should be relatively slow if your alignment is decent. -If you're still seeing elongated stars, it may be due to your optical train. Make sure your camera is square to the imaging train. 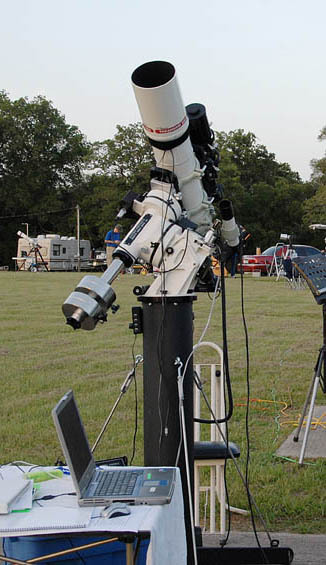 Non-round stars may be due to optical issues with your setup; don't automatically blame your mount or your guiding. -In the "duh" category: If your mount seems to be off in RA, make sure you're guiding at the sidereal rate, not the lunar rate. I believe accidentally hitting the "8" on the keypad can do this to you! I'm expecting my AP 900GTO mount to help improve my astro-photographs. Now if the weather would only cooperate! For the astro-geeks that might also be struggling with new AP GOTO mount setup issues, I have collected some information that may be helpful. 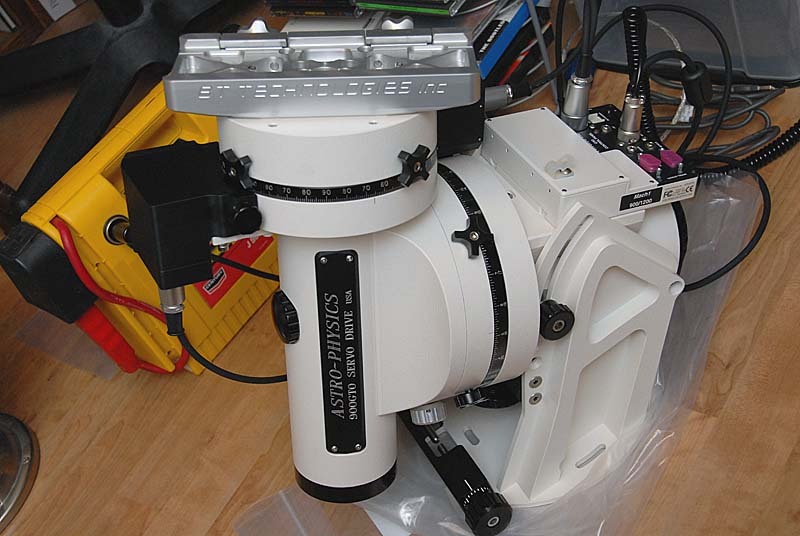 Polar alignment, pointing accuracy, and a wireless serial link to the scope are among the topics. 10/2007: Major excursion to the Davis Mountains, TX, USA. 9/2007 Fourth Field Trip. I had some guiding challenges during these September nights, but overall results weren't bad. After seeing some of my shots, I decided to double-check the mount's tracking. I set up at home and took 3 - 4 minute exposures from the back yard during a bright moon. Not ideal, but enough to see the mount is tracking pretty smoothly, and certainly I should be able to guide out any tracking irregularities. I should have done this first: Take a picture of your mount's tracking so you can see what it's doing! 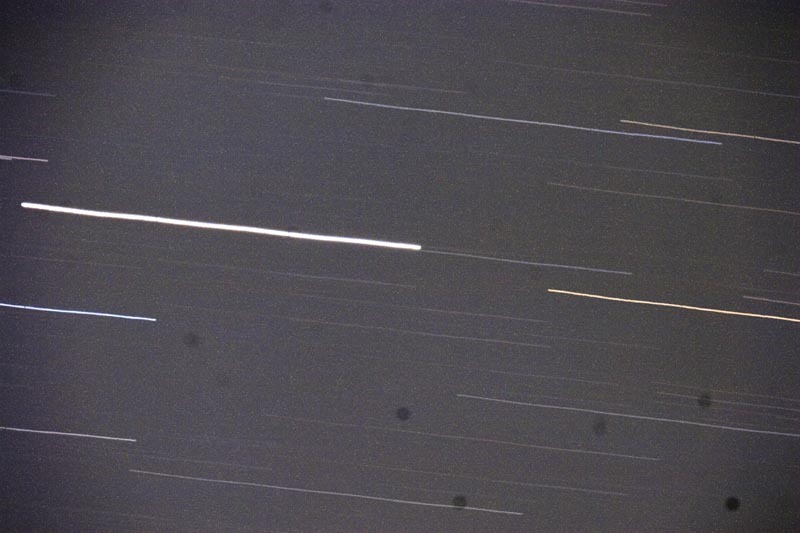 You can see the two notches in the star trails as the camera paused for a second or so between the 3 exposures. The worm period is around 7 minutes, so you're seeing about 1.5 rotations of the worm. See guiding tips at the very end of the page. Moon and Venus from the trip. 5/10/2007: Success with a "Bluetooth connection!" between my laptop running The Sky software and the telescope mount. No cords to trip over in the dark! Here's the secret to success: Do not install the drivers that come with DLink's DTB-120 USB to bluetooth adapter. 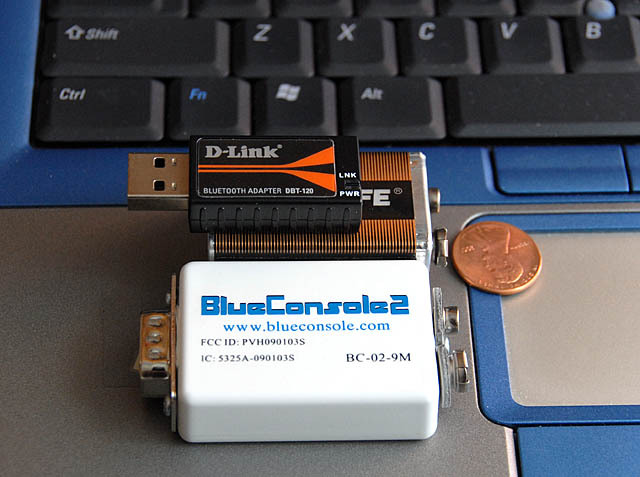 (This is a popular and inexpensive USB->Bluetooth adapter that apparently has at least 4 different hardware versions in the last several years.) If you do install them and are running Windows XP SP2, do what I did and go back to an old restore point. With Windows (it has to be the SP2 version) managing the DBT-120, I can connect The Sky6 wirelessly to the the AP 900GTO mount using a BlueConsole serial adapter connected to the mount's serial port. After getting rid of the drivers in short order I was rocking and rolling, wirelessly controlling the mount using The Sky 6. Thanks to Bill Pellerin of the HAS for the idea in May Guidestar. 11/2007: Trick number 2: Plug in the USB adapter into the same USB port every time, and boot the laptop with the adapter already plugged in. That's the only way it works! The second night was much smoother than the first, and I even took some time to look at Saturn. I drift-aligned the mount using my STV for about 15 minutes, taking notes on which way to turn the knobs. Pointing accuracy within the same general area of the sky was sufficient to get it in the narrow field of view at high power (200x). I would guesstimate it was within a degree or 2 of target when I crossed the meridian, easy to center in the finder, and maybe in a wide-angle EP. So the strategy is to just slew to a bright star in the part of the sky you want to be in, re-synch the mount to that star after you slew, and then you will have good accuracy in that part of the sky. I am pretty sure it's aligned well enough for the 4 minute DSLR exposures I typically take. (It's hard to be certain of anything when I'm on the wooden porch which can shift a big depending on where I am!) With the sturdier mount I'll probably be taking longer exposures at some point. I watched the tracking for a few minutes and didn't find anything to complain about. Actually it was too good at first, as somehow my the focal length had changed from cm to inches! If my setup is reading correctly I was averaging plus or minus one arc second guiding using .5 second updates and no PEM/PEC whatever it's called. I was also hoping to control the scope wirelessly with a D-Link DBT-120 Bluetooth adapter. This was to be connected to a BlueConsole serial adapter plugged into the serial port on the scope. That didn't work. I finally had all the pieces of my new mount and pier on 5/3/2007. Did the weather cooperate? No, we experienced severe thunderstorms that night, with numerous tornados being reported by the NWS (including one about 4 miles from our house!). First light took place on the next night in my backyard, under extremely warm and humid conditions with poor transparency (but good enough to see stars!). Note that due to numerous trees and the house, there is a fairly limited view of the sky at my house here in The Woodlands, which makes everything much more challenging. Not to mention the mosquitoes (addressed with "100% DEET" spray)! My main goal was to get the mount properly polar aligned and to see if I could get accurate "goto" behavior. Results were not great! Before it was dark I did my best to adjust the altitude before starting based on knowledge of where Polaris is in relation to the garage and trees in my backyard. (The Losmandy G11 has marks for altitude so you can get close, but the AP does not.) I started by trying the Two-Star Calibration method, where you tell the mount what it's point at, slew to another object, and adjust the alt/az of the mount to correct polar alignment. Repeat as necessary. Since this involves looking at the finder scope and a cross hair eyepiece while simultaneously trying to adjust alt/az, numerous contortions were required. Adjusting the altitude with a fully load mount also requires considerable effort in turning the knob. (The Losmandy alt knob is much more conveniently placed and easier to turn.) After a while it became clear to me I was not converging on accurate alignment. I was always landing within a few degrees of my target, but I wasn't getting closer. Time for plan B. Plan B was to get out the polar alignment scope. Being able to sight Polaris through the trees is always dicey at my place, and forget about the 2nd and 3rd stars in the polar alignment scope. There is an additional problem that the supplier apparently changed the polarity on the LED illuminator AP supplies with the polar scope, meaning that the illuminator extension cord can't be used at this time. I'm have spoken with Christine at AP and am waiting for them to provide a solution for this issue. I was able to just barely connect the illuminator and sight Polaris through the trees. It didn't seem I was too far off from being aligned, and I tweaked my alignment as best I could. Unfortunately, my goto accuracy and didn't seem to have improved after that, and a few more iterations of the "two-star" method didn't seem to be helping. I decided to punt, pack it in, and refer back to the instructions to see what I might be doing wrong, etc. One possible issue is that the scope is not orthogonal (at right angles) to the mount, but I'm using BT Technologies plates and a Takahashi clamshell and I doubt that is too far off. It turns out the problem is likely with the routine itself and the stars I was choosing. After further reading, next time out I'm going to hook up my STV and drift align, and then see how accurate my goto's are. If I'm definitely aligned and not hitting my targets I have to assume I have an orthogonality issue. A weakness of the AP controller is that it isn't capable of taking orthogonality issues into account; software like Tpoint does that however. > calibration I seem to be 'oscillating' back and forth in azimuth. mount after using other commercial Alt-Az mountings. 1. I place the mount and scope in Park1 position using a simple carpenter level. 3. I then slew to Park2 and level the tube manually using the carpenter's level. 4. I slew back to Park1 and level the tube using the altitude adjustment. This completes the initial setup of the altitude axis. azimuth to bring it near the center of the finder crosshairs. telescope at low power for further polar refinement before the sun has set. and have no orthogonality problem, then the star will be on the crosshair. In the first iteration, you want to ignore any east to west difference (east to west error is exactly twice the orthogonality error of your scope). Concentrate on getting the North to south error down to zero. You do this by moving the star half way to the crosshair with the buttons, and then adjusting the altitude axis to bring it the rest of the way. Now press Rcal and change the meridian swap time back to zero. Enter the star again and do another slew. This time you will see that the star will be much closer to the crosshair north to south, although east to west error will be the same. Do one or two more iterations, and you should have the altitude axis nailed down dead nuts, where the star will come back to the crosshair line give or take a fraction. To speed things up, I always use the tour mode, pick stars per constellation, pick alpha, beta or some suitable candidate etc. This way I don't have to scroll thru the stars list each time I want to enter the star again. The button on the lower left will bring up the menu for meridian delay and Rcal, so it is real fast to go between these 3 functions. What about orthogonality and the azimuth axis? If you stay on one side of the mount, either east or west (now that you have perfect altitude setting), you can slew between 2 stars, one somewhere north and one toward the south in the sky. These two stars can then be used to tweak in your azimuth setting - just be sure to not touch the altitude axis. Once this has been adjusted (it should take only a few iterations), your mount will be very close to polar alignment and should point properly. However, if your scope is not orthogonal, there will be a pointing error when you cross the meridian and the scope swaps sides. The error will be twice that of your non-orthogonality. You can fix this by adding shims under your mounting rings (very difficult if you have only one ring holding the scope on the mount), or you can ignore this by recalibrating on a known star when you do swap sides before proceeding to a faint fuzzy. Once you are on the other side, even if you have an orthogonal error, you will find that most objects will be centered in the field if you have first recalibrated on a known object. of my setup when compared to my previously owned GOTO mounts. orthogonality and precise polar alignment for pointing accuracy. center and press Recal to improve the accuracy of the next slew. Scientific and fit it to my SBIG filter wheel in the Moon filter position. each exposure. After 3 or 4, I can see immediately how far off I am. sensitive to misalignment). In the meantime, I have ignored any drift in RA. the image is actually allowed to drift. alignment in about 1/2 hour, all the while the sun is up. One full turn of the azimuth knob is approximately 0.63 degrees (38 arc minutes). Each long registration mark is about 7.6 arc minutes; each short mark is about 1.5 arc minutes. One full turn of the altitude knob is approximately 0.64 degrees (38 arc minutes). over the place? If so, you might have an atmospheric seeing problem. of the mount, since that axis is not driven. vital information that you will need to set up your guiding later on. you will not have the info needed to do a first class imaging job. purest way to see whether your mount is tracking well all by itself. night long and have a very nice result. 1. wires dangling off the back of CCD cameras that can subtly "pull"
the mounting rings before dropping them to the ground below. sometimes 1x3 arc sec, depending on the orientation of the mount. Worst orientation is looking due south. cause 1 - 4 arc second jumps in image position on the CCD chip. which can drive a guider nuts. misalignment and the natural periodic error of the worm. figure out if hand controller is right. Use stars on the celestial equator. a. If the star drifts south, the polar axis points too far east. b. If the star drifts north, the polar axis points too far west. a. If the star drifts south, the polar axis points too low. b. If the star drifts north, the polar axis points too high. alignment error of one degree (for alt or az). each axis moves at close to 1/2 degree for each full rotation of the knob.